Neurones are nerve cells and are responsible for processing the information that the nervous system receives and controlling responses and actions. They are able to accomplish this by means of being electrically excitable cells that can undergo subtle alterations of their transmembrane potential. Changes in the trasmembrane potential allow neurones to integrate the information they receive and produce an appropriate output. The ability of neurones to generate action potentials is central to their function. Neurones are extremely dependent on aerobic metabolism and are thus very sensitive to hypoxia. If neurones are deprived of oxygen for as little as four minutes they can die. 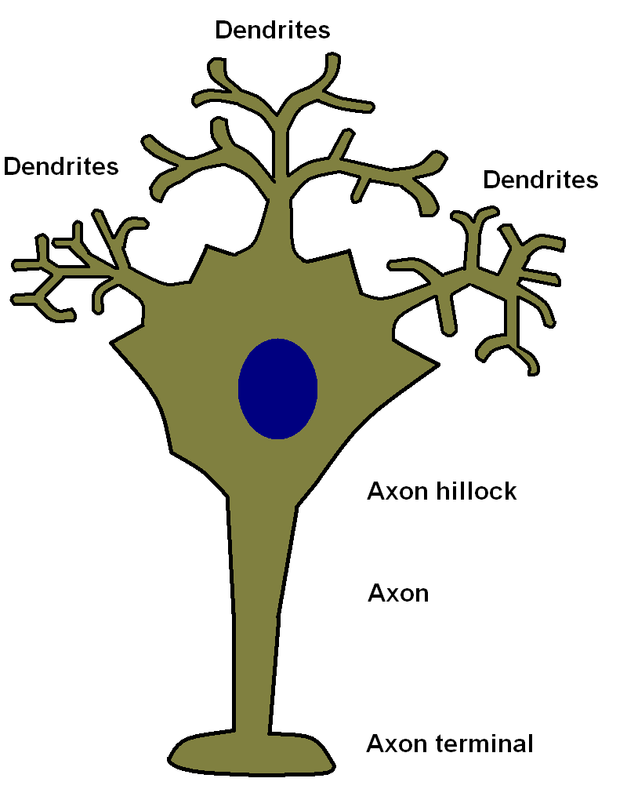 Neurones possess three parts, the cell body, the dendritic tree and the axon. The cell body houses the nucleus of the cell, many mitochondria and the protein synthesising organelles of the cell, as well as the other usual contents of cellular cytoplasm. Neuronal cell bodies are often quite large. The cell body is the only part of the neurone which can make proteins. The axon is a specialised projection of the neurone that is the output part of its circuitry. A human axon can be over a metre in length (large animals may possess axons which are several metres or more in length). The axon is the only part of a neurone that can fire an action potential and conduct electrical signals away from the cell body. The part of the cell body where the axon emerges is known as the axon hillock. Each neurone possesses only one axon, although that axon may branch in order to contact multiple targets. The end of the axon forms a specialised structure known as the axon terminal which is adapted to allow synaptic transmission. The dendritic tree is a network of projections from the cell body of the neurone that can resemble the branches of a tree. Many neurones have dense dendritic systems of this sort, although others possess far more simple dendritic networks. The dendrites receive input from numerous other neurones (usually up to 1000) and have a vital role in processing this received information. Unlike axons they cannot generate action potentials. Dendrites conduct electrical signals towards the cell body. The cytoskeleton is a network of proteins that is found in cells that provides structural stability and shape to the cell. The cytoskeleton is especially important in neurones due to their possession of numerous projections and is provided by specialised intermediate filaments known as neurofilaments. Neurofilaments have a diameter of 10nm. In addition to neurofilaments, neurones also possess microtubules. Microtubules are hollow tubes that have an external diameter of 23nm and a luminal diameter of 15nm. They are composed of alpha and beta tubulin subunits and are essential for axonal transport. The alpha and beta subunits are arranged in an alternating fashion in a chain that forms a protofilament. Protofilaments are then combined to yield a hollow microtubule. The use of alternating alpha and beta subunits imparts polarity to the microtubule because all the protofilaments line up in the same fashion such that one end of the microtubule is formed only by alpha subunits (minus end) and the other only by beta subunits (plus end). The way in which the transmembrane electrical potential of neurones is generated is discussed in the section which covers action potentials. However, the resting membrane potential of neurones is in the range of -70 to -90mV. If the cell is sufficiently depolarised to reach the threshold for the generation of an action potential, around -60mV, it will fire an action potential which will spread along the axon and depolarise the axon terminal(s), causing synaptic transmission to occur to another neurone or a target organ. Neurones receive inputs from other neurones via synapses that terminate on their dendritic tree and their cell body. Conduction in the dendritic tree and across the cell body is passive, without the boost or surge of an action potential. Electrical resistance in the cytoplasm of the neurone means that signals which enter the neurone further away from the cell body have less impact because their current dissipates as it flows towards the cell body. Ultimately it is the membrane potential at the axon hillock that determines if the neurone fires an action potential or not. For these reasons synpases that terminate close to the axon hillock have a far more powerful influence than those that terminate in the periphery of the dendritic tree. Further complexity is added to this electrical processing by tiny structures known as dendritic spines. These are minute projections from the dendritic tree that receive synapses from other neurones. Dendritic spines have very narrow necks, which means that their local cytoplasmic contents are partially isolated from the rest of the neurone. Certain patterns of activity within a neurone as a whole and its synapses individually can cause the neurone to strengthen or weaken specific, individual synapses. The localised environment provided by the dendritic spines permits neurones to modify single synapses even though it may have a thousand or so such synapses. Modification of synapses causes their signal to become stronger or weaker. The synapses which a neurone receives can either be excitatory or inhibitory. Similarly, neurones tend either to excite other neurones or inhibit them but do not manifest both actions. An excitatory synapse is one that reduces (makes less negative, depolarises) the membrane potential of the target cells and therefore nudges it towards firing an action potential. An inhibitory synapses increases (makes more negative, hyperpolarises) the membrane potential and thus moves the neurone further away from generating an action potential. In summary, neurones use their dendritic trees and cell bodies to receive and integrate multiple inputs, both excitatory and inhibitory, in order to produce a final result at the axon hillock. This final result determines whether a neurone sends signal to other neurones or effector cells or does not. Neurones can be classified in different ways, such as by function and shape. Efferent Efferent neurones carry signals from the central nervous system to effector organs. In the somatic nervous system they are called motor neurones. Relay Relay neurones are also called interneurones and pass a signal between two neurones. Adding an extra layer of a pathway allows greater modification. Multipolar Multipolar neurones have at least two branches to their dendritic tree and will often have very complex dendritic trees. This allows them to integrate a lot of inputs. Bipolar Bipolar neurones have one axon and one dendritic branch. The axon and dendrite are on opposite sides of the cell body. This configuration is common in relay neurones. Pseudounipolar Pseudounipolar neurones are found in parts of the sensory system. They have a single axonal projection which splits into two. One part of the axon runs to the central nervous system while the other projects to the periphery where its terminal forms a specialised sensory organ. It has been suggested that this peripheral part of the projection is a dendrite because it conducts signals towards the cell body of the neurone, but because it can fire an actional potential it can be argued that it is better classified as an axon. Excitatory Excitatory neurones depolarise their target. Inhibitory Inhibitory neurones hyperpolarise their target. Certain types of neurones have specific names, such as the Purkinje cells of the cerebellar cortex, the anterior horn cells of the motor system and the Betz cells of the primary motor area of the cerebral cortex. Only the cell body of the neurone has the ability to synthesise proteins (although recent findings suggest that axons may possess some limited capacity). This means that any structural proteins, enzymes and even mitochondria that are required by the axon, the axon terminal and the dendritic tree have to be produced in the cell body then transported out into the axons and dendrites. In the case of axons in the peripheral nervous system, the target can be over one metre away so neurones require an internal transportation system to ferry equipment to their axons. This delivery system is axonal transport and relies on the properties of microtubules. Axonal transport operates in both directions. Antegrade transport moves material away from the cell body towards the axon terminal. Retrograde transport moves material back towards the cell body. The ability to direct movement is a result of the alternating alpha-beta structure of microtubules and the polarity with which that endows the microtubule. The little molecular engines that pull the materials to be transported along the axon are kinesin and dynein. Both these proteins hydrolyse ATP to release energy and use this energy to walk along the microtubule, guided by its polarity. They each have two heads that attach to the microtubule. Kinesin moves towards the plus end and is therefore responsible for antegrade transport while dynein moves towards the minus end and therefore undertakes transport in the retrograde direction. Kinesin and dynein are attached to the structures to be moved (mitochondria, synaptic vesicles, structural filaments, other veiscles). There are two forms of antegrade axonal transport, fast and slow. Fast transport moves at 50-400mm per day. Slow transport goes at only 8mm per day. Curiously, the reason for the slow pace of slow transport is that the cargo moves in a stop start fashion. When the cargo of slow transport is actually moving its speed is the same as that of fast transport. Retrograde transport has only one rate, 100-200mm per day. It carries breakdown products, worn out organelles, endosomes and proteins back to the nucleus for processing. Although they are a structural protein, microtubules are not rigid, unchanging molecules. Instead, they exhibit a phenomenon called dynamic instability. The alpha and beta subunits both bind GTP. If the subunuit at the end of a protofilament has GTP bound, it is stable. If the end subunit has only GDP attached to it, it will detach. Subunits in the centre of the filament may be in either the GTP or GDP state. If the GTP state subunits at the end of the microtubule are lost, the GDP subunits in the middle can quickly separate from each other. However, provided that the end of the filament is protected by GTP subunits any GDP subunits in the middle are stable. Alpha subunits that have GTP bound tend not to hydrolyse it to GDP, but beta subunits often show hydrolysis of their GTP into GDP once they are incorporated into a microtubule. Both alpha and beta subunits can only bind if they are in the GTP state. The balance between hydrolysis, addition of new subunits and the loss of GDP subunits from the end determines whether the microtubule retains a stable length, grows or shortens. Neurones are not capable of undergoing mitosis. For decades it was believed that neurones could not be replaced in the adult brain. However, recent research has indicated that there is a small pool of stem cells that can provide new neurones. Nevertheless, this process of replacement does not seem to be adequate to overcome injuries that cause neuronal death, such as a cerebrovascular accident. Although neurones cannot replicate, they are not inert. Modifications in the strength of synapses can alter the behaviour of a neuronal circuit but memory and learning are more complex than altering the efficacy of synapses. Neurones can sprout new axon terminals through structures known as growth cones and these can form new synapses. If an axon is severed it can regrow and reinnervate its target, provided that it can find its way to that target again. Long term potentiation is one of the most studied candidates for one of the mechanisms for memory. In essence, long term potentiation is the strengthening of a synapse and occurs when that synapse is stimulated when the neurone is already depolarised. Specialised neurotransmitter receptors called NMDA receptors are involved in this process of detecting the coincidence between activity at the synapse and co-existing neuronal depolarisation.